Taking a little hiatus during these dog days of late July and early August. Are you like me and in need of a summer reading suggestion? I found 20 great ideas from this Business Week list. Managed Print Services definitional dust-up: tempest in a teapot? A number of industry insiders, including at least three of my fellow printer industry bloggers, have been following and commenting on the seemingly strange and confused reaction from the Printing Industries of America (PIA) at the time of HP's MPS announcement last Monday, July 13th (see "HP (NYSE HPQ) Guarantees Print Savings"). While the most part I agree with the bloggers about mass confusion and unclear semantics overriding common sense in many of the arguments, some of the growing number of comments to the WhatTheyThink post have me thinking and reflecting, too. During my career working at HP, I was around for the emergence of the "printing pie" chart that has come to be famous as the "one-slide strategy presentation" still commonly used by many in the industry. The idea of the chart, in its many variations, is to show today's digital printing volumes, based on pages or other metrics, as a relatively small slice of the overall (digital plus analog) print universe. Make no mistake, at the very highest level, that "pie" is a tool to describe the vast opportunity that exists, 15 years ago or today, in converting analog to digital pages. While we see many tactical implementations, whether by Company A or Company B, or division X or division Y of Company H, the underlying goal is generally the same. In the biggest of all pictures, all printing is connected, from commercial print on the high end to simple pen-and-paper and typewriters on the lowest end. Ask the latter -- did digital printing change your business? Did Royal and Smith Corona need to be concerned? And of course in marketing and economics we also try to look beyond direct competition to substitute goods and services. What about "not printing"? Just something more to think about! Tech news on this July 17th includes the "retraction" of two of George Orwell's classic works (Animal Farm and 1984) by Amazon (NASDAQ AMZN) from legitimate past purchasers via their Kindle e-books. David Pogue of the New York Times offers an excellent perspective (see "Some E-Books Are More Equal Than Others"). Now I suppose some printer-oriented folks might just be thinking, what if I'd PRINTED my Orwell novel from my Kindle, before the long arm of Amazon reached out? (Of course, Kindle printing capabilities, limited as they are, were first discussed here in a post simply titled "Kindle Printing". As promised last month when the ZINK Imaging's "Re-imagine Printing" finalists were announced (see "Zero Boundaries Design Contest". ), a group of winners have just been named by the proverbial distinguished panel of judges. Selected from a group of 40 finalists split between two categories, the first-, second- and third-place finishers, along with winner of the People's Choice award, hail from far-flung locations throughout the world, which speaks to the effectiveness of ZINK's effort, along the total volume of hundreds of design entries and the thousands of votes (over 7,000) over the past few weeks for the People's Choice contestants (all 40 finalists). 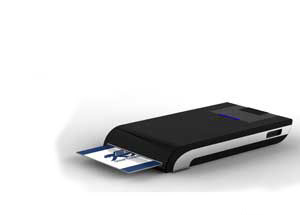 The SmartBC, an on-demand Business Card printer from Brazil's Arthur Ditlef (see photo above), prevailed in that category. So congrats are due to the innovative crew at ZINK imaging, the judges panel, and all the contestants including of course the finalists and seven prize-winners. This first-of-its-kind "printer design crowdsourcing" effort shows the vitality that exists in thinking about news ways to print, and beyond! Also see Xconomy.com's excellent coverage of the contest background and winners in a piece by Wade Roush. In my July 2009 Observations, "Twitter Printing -- Print those tweets! 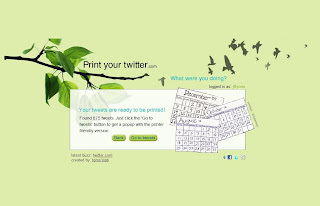 ", I included the web site printyourtwitter.com (btw printyourtweets.com get you to the same site.) This interview, of the creative source behind the site, is republished here and also accompanies the column in the Observer. Jim Lyons, Observer columnist and blogger, recently sat down with Thomas Ummels, creator of printyourtwitter.com to find out more about this exciting Web service. Lyons: You mention in your blog post that you developed the program first for yourself. Tell me a little bit about yourself. Ummels: I am a freelance Web developer and really love technology and my job. Two months ago, on our way back home from a visit to my parents, my wife wondered aloud whether it was possible to print tweets. We twitter with a group of close friends and our tweets are becoming a really nice journal of our current personal life. Especially since the iPhone is used to add pictures to part of the tweets. The same week some other developer I was working with on a project told me about the open and transparent character of the API of twitter.com. So when my wife asked me about printing tweets, ideas started to pop up in my head. When we came home, I quickly checked out the twitter API and looked if there already were tools available. I thought it was a nice challenge, and there were no other tools for printing tweets, so the next day I started coding, and the result can now be seen at printyourtwitter.com. We haven’t done much promoting yet other then through twitter. 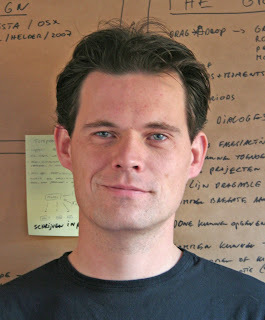 A couple of Dutch Web sites featured printyourtwitter.com, and I was interviewed on Dutch national radio. Lyons: You also mention the program has picked up a lot of interest, more than expected. Do you have an interesting story or two about users of Print Your Twitter? Who is using it and how? Ummels: I get a lot of enthusiastic responses. People mostly use the tool to backup their tweets. I heard from one user who had kept his friends and family up to date during his vacations through twitter. After coming back he printed his tweets and gave them to his grandparents who had no access to the Internet. And a friend of mine has a 7-year-old son who also twitters and his tweets are really funny. Every year, she makes a photo album for them at their birthday about their life in the past year. This year she printed his tweets and included them in his album. Lyons: How about numbers? How many users? How fast is usage growing? Ummels: The numbers go up and down depending on whether it gets mentioned on some Web site or in the media. Currently, we are around a 100 users a day. I think a lot more people could be interested in the tool, but it is still a side project for me and promoting a site like this is a lot of work. So although it was a lot of fun to build and it is nice to get positive feedback, promotion is currently not our highest priority. Lyons: It is great that you added keyword (hash tag) search. I just used that too, and it is very handy. Any more upcoming features we should know about? Ummels: I get a lot of questions, so I am planning to add some functionality in the next three weeks. I want to incorporate some filtering functions (only tweets with images, only tweets between two dates, or only tweets of a certain selection of your connections, so you can, for instance, subtract a conversation between two people from your tweets). We want to integrate more picture services (now only images on twitpic are included), and we want to offer some different print templates. If the number of visitors is high enough, we also want to include links to printing services so people can order a book of their own tweets. Lyons: Any feel for how many users go all the way and actually print their results, rather than storing them as a PDF for searching or future reference? Ummels: No, I have no idea. Due to the technology that is used, we can’t measure it. I would expect that more people save their tweets by saving the Internet page with the printer friendly version or by printing it to PDF than that people actually send them to their printer. Once in a while, we get remarks on what a waste of paper it is to print all your tweets. So I encourage people to use paper as sparsely as possible. But if your tweets truly have value to you why not print them and include them in your journal or diary for instance. 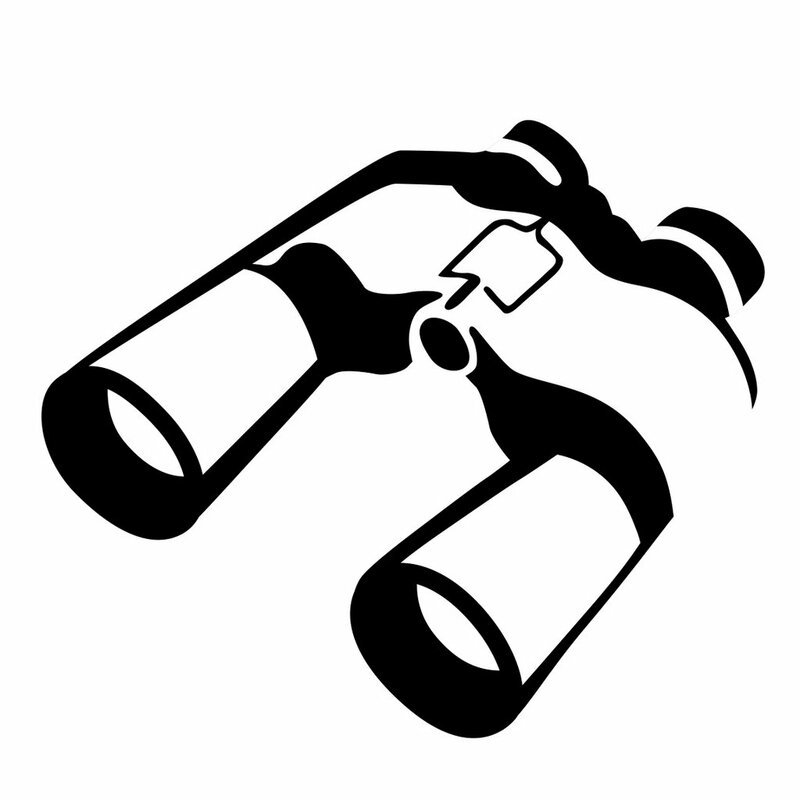 Observations: Twitter Printing -- Print those tweets! One would have to be living under a rock to not have been exposed to the Twitter phenomenon this year. Some of the newsworthy mentions that easily come to mind include the (distracted) audience members’ tweets, including those of many members of the U.S. Congress, posted during the new U.S. President’s first major speech; the role of Twitter in breaking news developments on “the Miracle on the Hudson” plane landing; tweets during the sudden and sweeping Swine Flu outbreak in April; and more recently, Twitter's role in June's Iranian presidential election and the controversy following it and the news around the tragic death of entertainment icon Michael Jackson. 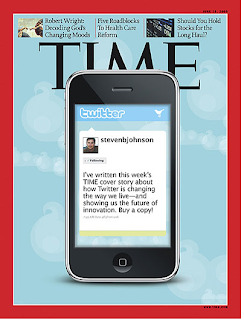 Time Magazine devoted its June 15 cover to Twitter, asking the question, "How Will Twitter Change the Way We Live? ", so appropriately enough in this month’s Observations, I’ll pose a version of that same question, "How Will Twitter Change the Way We Print?" I personally have been a Twitter account holder (@jflyons) for about a year and a half. Not exactly an early adopter relative to Twitter’s origin in 2006, but early enough. But truth be told, from that point of curious registration early last year and a handful of "tweets" to follow, I really only got serious about Twitter nearly a year later, about the same time as the first of those previously mentioned events in 2009. In fact, a blog post of mine, "Do we need Printer Industry Tweets?" in February of this year was met with a polite chorus of readers commenting back, basically, "Hey clueless, we already have them!" I guess my excuse was, as author Steven Johnson points out in the first line of his Time cover story, "The one thing you can say for certain about Twitter is that it makes a terrible first impression." But I have come to appreciate, and even at times become consumed by, the charms of Twitter and its bevy of tweeters. Agreeing with Johnson’s assessment, again, I find it an invaluable resource for both finding links to interesting articles and other online content, common and obscure. It is also a unique tool, as compared to the longer-cycle blogs and other online (more traditional) media, for both digesting and sharing quick reactions to real-time conference activities and the like. By monitoring Twitter, I felt a part of May's "All Things Digital" this year, though I missed the actual conference. I also enjoyed reading others’ views in the “tweet-streams” from this year's Demo Conference in March, and also participating with my own, and most recently, keeping abreast of HP’s (NYSE HPQ) San Francisco news event introducing the firm’s new Web-connected printer (see "HP Reveals"). Future issues of this column may delve into the depths of the question, “Why print tweets?” but for now, suffice it to say that in the case of using Twitter to pass the word via quick link sharing, the need for printing is not so obvious. But in the case of collecting ideas and opinions from many or a few (or one) authors, a hard copy treatment may make a lot of sense. While probing around a few months ago to find out if anyone was doing anything about reducing (preserving?) tweets to hard copy form, I found an interesting compilation of tweets into a form of personalized diary. The whole story can be foregone, but the blog post, entitled "Twitter Printing," describes a devoted Twitter following a multi-step process to end up with two years of his entries, entitled, simply enough, "My Life in Tweets." But like in any fast-moving technology field, more has happened since. Most prominent on my radar lately is the Web site, www.printyourtwitter.com [www.printyourtweets.com works identically], a Web service that allows the reduction of Twitter messages, either your own or others, based on Twitter identity or keyword (or hashtag), into a form that allows for easy printing, or if not actual printing at least saving in a print-friendly form, like PDF. While pretty bare bones, I found the Web-based service a model of simplicity. In addition to using my own tweets for an example, I entered the hash code #hpreveal, which was used for the aforementioned Twitter-oriented HP announcement. The search quickly came up with more than 877 individual Tweets and formatted them in a chronological log that spans 75 letter-sized pages, which I saved as a PDF for possible printing later. I had a chance to interview TomsLab’s Thomas Ummels, creator of PrintYourTweets, whose entrepreneurial, creative spirit shows what can be done with the latest opportunities that present themselves, like Twitter (see "Behind the Scenes"). PrintyourTwitter is an exciting development in the world of printing tweets and the fit between the hard copy world and Twitter. Ummels is looking for sponsors for the site, which I think would be a great idea for one or more printing industry players out there who want to show how Twitter-friendly they are! Next month, I will explore more about Twitter and its document-management capabilities, which includes some old (and new) friends in the industry. A couple of topics covered here recently provide the foundation for some intelligent discussion over at The Databazaar Blog. Their post, "Doomed From the Start, The Printed Blog Shuts Down" echoes some of the sentiments expressed here (see "Ultimate Countertrend? - The Printed Blog"), and expands on the demise of the noble and interesting (to me, anyway) experiment. Thanks for the link, too, DBB! And the next post down, "Rojas and Block Weigh in on Photosmart Premium With TouchSmart Web", offers a take, two actually, on the recently announced all-in-one inkjet (see my post from announcement day three weeks back, "HP Reveals! Web-enabled inkjet all-in-one sets new industry direction"). The post is actually a summary of the Rojas/Block gdgt weekly podcast, but kudos to DBB for the quick summary and also for coming up with the name "Presto", another HP-based quick-and-easy solution for communications (see my November 2008 Observations, "Hard Copy Communications for Families"). Peter Rojas and Ryan Block of Engadget and GDGT fame seem to take pride in never discussing printers on their popular podcast. But they couldn't resist HP's full court public relations press so they broke down and chatted about the Photosmart Premium With TouchSmart Web on their June 25, 2009 podcast. One footnote -- interesting to see Databazaar's offer of a free $30 gas card with the purchase of two qualifying HP (branded) toner cartridges. I just saw a similar offer this morning from OfficeMax for a free Microsoft wireless keyboard/mouse combo, with the purchase of two HP eligible toner cartridges. And it was just a couple of weeks ago that I received a free Bluetooth headset, included with the purchase of a single toner cartridge (it wasn't an HP-brand cartridge, but it was the same brand as that of the laser printer in question!). In an announcement this morning, HP rolled out their "Payback Guarantee for Managed Print Services Customers", along with accompanying full-page ads in the Wall Street Journal and New York Times. The press conference, hosted by none other than Ferris Bueller's Ben Stein, is ongoing, with numerous interesting tidbits offered by HP execs and MPS customers ST Microelectronics and Intel. Notable tidbits are showing up in the tweetstream (#HPMPS) and will be summarized here later. An interesting release is out this morning from Lexmark International(NYSE LXK), touting the "world's first line of Web-connected touch screen all-in-one printers". It was just three weeks ago, also on a Monday morning, that printer industry leader HP (NYSE HPQ) trumpeted their HP Photosmart Premium with TouchSmart Web AIO (see "HP Reveals") with the press release headline "HP Introduces World’s First Web-connected Home Printer". The new line includes three Web-connected touch screen AIOs with Lexmark's myTouch capacitive 4.3" touch screen technology. The touch screen AIOs will be available at competitive price points ranging from $199 to $399. Lexmark's myTouch with SmartSolutions technology is an innovative, easy to use approach to user interfaces and includes easy-to-read graphical icons for basic AIO functions and "as needed" navigation for a more user-friendly experience. A little less than a year ago, I looked into the printing capabilities of the new Google (NASDAQ GOOG) Chrome browser (see "Google Chrome Printing") on its first public Beta release. That post was rather inconclusive (though I did follow up with a description and link to a nice little tweak to add a print button to Chrome (see "Google Chrome Printing revisited"). The most notable point about the first post turned out to be the "fine print" controversy that swirled around the browser in its first weeks post-release, driving search engine traffic my way, when what I'd covered was only about the program's printing facility, not Google's purported devious intentions hidden away in Chrome's EULA. Yesterday, Google Chrome, this time designated a planned new Operating System for Netbooks, burst onto the scene yesterday, there was nary a mention of printing, which is not too surprising. Of course the big angle of the story is the affront to Microsoft (NASDAQ MSFT), who recently fired a surprisingly on-target shot across Google's bow with their Bing search engine. The most relevant printing and imaging tidbit I have found so far is from the released list of Google Chrome OS partners. Printer leader HP (NYSE HPQ) is on the list along with other PC-and-chip vendors like Acer, ASUS, Freescale, Lenovo, Qualcomm, Texas Instruments, and Toshiba, so it's obviously a PC/Netbook play for them, but the one seeming outlier on the list (to me at least) is Adobe (NASDAQ ADBE). This one needs some study! A simple explanation for long-time industry observers could be simply "anything to align against Microsoft" but there is certainly more to it than that! Over the July 4th weekend, the New York Times featured two companion pieces, by Vindu Goel, on the printer software company GreenPrint. I've covered GreenPrint many times in this blog, and have been a regular user of their software as well. Going back to February 2007's monthly Observations column (which also appeared in the Hard Copy Observer; see "Making to the Top of the PR Mountain"), I've since written about the company's activities multiple times, so it's interesting to find myself, again, covering both their product (Version 2.0 of their flagship product was just released in the last several weeks) and their PR successes simultaneously. I use the phrase "PR successes" in the spirit of the "did-they-spell-my-name-right" PR tradition because unlike their original Wall Street Journal virtually all-positive coverage, the Times NY Times pieces can be viewed more as a "glass half-empty, half-full" saga of the company and a somewhat perfunctory review. The first and more substantive piece (and the one that appeared in the print editions? 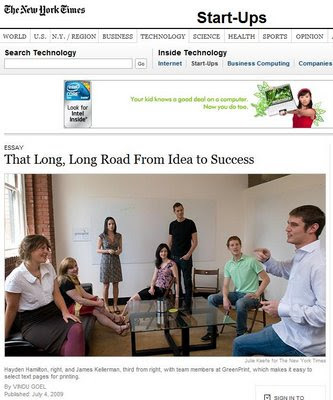 -- I get so confused these days), is entitled "That Long, Long Road From Idea to Success" and is labeled "Essay" in the "Start-Ups" section. (See screenshot above.) And while author Goel captures a great deal of the color in the company's history, including some of its ups and downs and even some of the rationale and technology behind Version 2.0, the characterization of the state of the larger printer/printing industry misses the boat, in my admittedly insider's opinion. Most notably, the characterization of HP's (NYSE HPQ) role as the printer industry leader feels at least a bit one-sided, Goel paints HP as focused on efforts to "bolster, not reduce, consumption of ink", using the Dom Pérignon Champagne comparison to paint HP ink as exorbitantly expensive. (That comparison is often an effective tool!) But a little more research might have pointed to HP efforts to help customers control printing costs and volumes (for one of many examples, see "HP's 'reduce printing' tool for the Web"), and whether a reduction is intended or not, some further simple research would point to HP's (and the industry's, by proxy) SERIOUSLY flagging print volumes, as measured by recent quarterly supplies revenues (see "HP Q2 2009 Printer Metrics"). While the combined affect of recession and conservation, the print volume downturn of late makes quoting HP's traditional "49 trillion pages in 2006, 57 trillion pages in 2010" (which leads the second piece, the blog entry, "GreenPrint Saves Paper and Ink at the Price of Speed") seem out of step with the times, and weakens the analysis, again from my industry insider's view. This applies, too, to the quote from HP environmental Vice President Stacey Wueste on the "explosion in digital content...[driving] a set of printable opportunities" that implies there's more, rather than less, printing happening. YES, the printable opportunities are shifting in terms of where pages come from, but with recent double-digit declines in supplies revenues, the new pages are still not making up for the old, now-uprinted ones! The overall piece, despite my admittedly snarky misgivings on the points above, paints a great picture of the drawn-out tale of a startup, and I greatly appreciate both the opening and closing phrasing that author Goel has crafted. SAVE paper, save ink, save money, save the planet. Marketing doesn’t get any better than that. As a part-time professor of marketing and innovation, I can and definitely will be using this stuff in the future. And taking my lead from the Times, I'll report on my experience with GreenPrint 2.0 please in another post, coming in the near future. The Printed Blog (TPB), subject of my April 2009 Observations (see "April 2009 Observations, Ultimate Countertrend -- The Printed Blog"), has closed down, according to an email I received this morning from Joshua Karp, TPB founder. The message cited a lack of funding sources, certainly not a unique issue in these times for startups. Karp also has a farewell blog post well worth reading.